The online version of this article ( https://doi.org/10.1186/s40168-019-0677-7) contains supplementary material, which is available to authorized users. Plants are in continuous contact with a huge diversity of microorganisms present in their environment. Accumulating evidence supports that plants and microorganisms have co-evolved and adapted to make close associations . Recent studies showed that plants actively shape their associated microbiomes [2, 3, 4]. Some members of the microbiota, including arbuscular mycorrhizal fungi (AMF) and plant growth-promoting rhizobacteria (PGPR), assist the plant in nutrient absorption, pathogen resistance, and growth promotion . Conversely, other members are detrimental to plant health by causing diseases that affect overall plant yield and value. While these microorganisms are well-studied, the effects on plant health and growth of the majority of the members of the microbiome are still unknown. Benzoxazinoids (BXs) are produced by several species of the grasses (Poaceae), mostly during the early stages of plant development, and steadily declining as the plant matures. BXs are indole-derived compounds, and they are found in plants in different forms . In some maize inbred lines, the glucoside 2,4-dihydroxy-7-methoxy-2H-1,4-benzoxazin-3(4H)-one (DIMBOA-Glc) and its precursor 2,4-di-hydroxy-2H-1,4-benzoxazin-3(4H)-one (DIBOA-Glc) are predominant [12, 13, 14]. When secreted into the soil, 6-methoxy-benzoxazolin-2-one (MBOA), a DIMBOA hydrolysis product, undergoes microbial transformation to produce phenoxazinones , a group of compounds known for their broad and powerful biocidal properties . BXs have been widely acknowledged for their importance in plant defense , against insect pests and pathogens in both above and below ground parts of cereals [18, 19, 20, 21], but also in allelopathy [21, 22]. For example, BXs are antagonistic towards insects, including aphids and corn borers, the bacterial genus Bacillus , and fungi such as species of Fusarium [21, 24]. Recent studies indicate a potential role of BXs in attracting the plant growth-promoting bacterium Pseudomonas putida towards plant roots . So far, several examples of BX effect on single insects, plant pathogens, and beneficial microbes have been observed; however, many aspects of the influence of BXs on microbial communities in roots and shoots are still unknown. 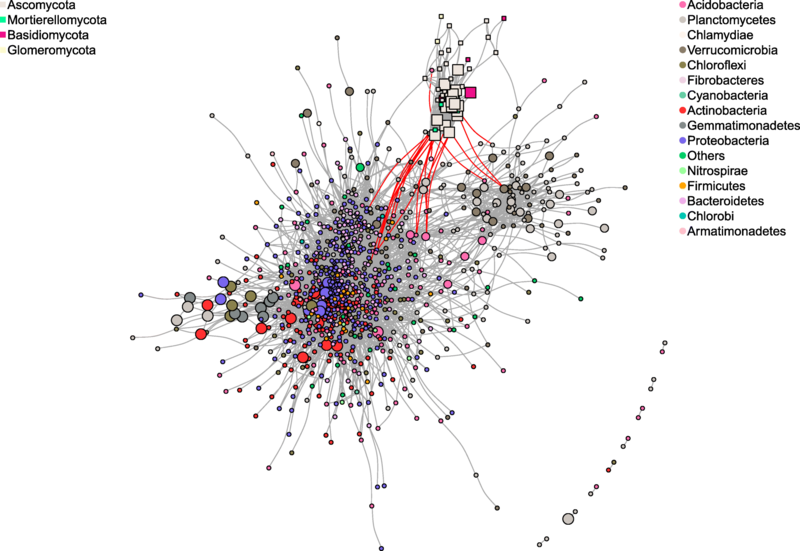 The effect of plant genotype on plant-associated microbial communities is well documented [49, 50, 51, 52, 53, 54]. 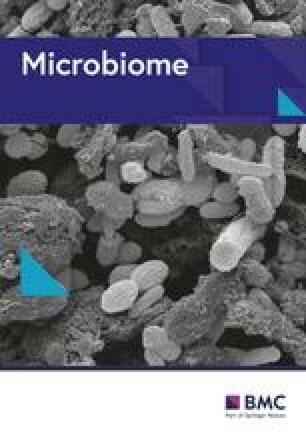 Despite the univocal evidence of plant genotype effects on microbiome assemblage, and that a repertoire of plant exudates including secondary metabolites unique for each plant genotype drives microbial assemblage, little research attention is directed towards the mechanisms involved. 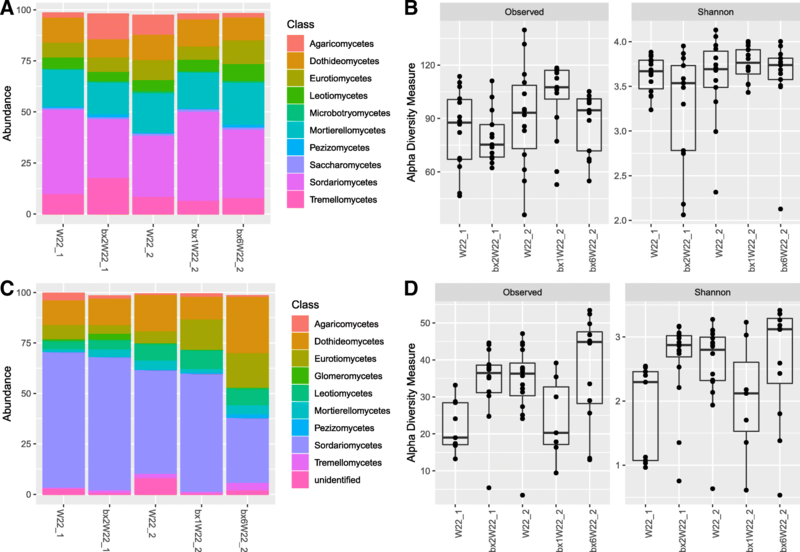 In this study, we used well-characterized BX mutants and their respective parental lines to dissect the influence of the defensive secondary metabolite BXs on the maize microbiome. To investigate BXs, we assumed that belowground BX effect would be highest in the roots followed by the rhizosphere and with only minor effects in the bulk soil, and thus, roots and rhizosphere became the prime focus of the present study. We defined the root compartment as the root including the rhizoplane (the plant root surface), known to modulate the most dynamic microbial-root interactions . 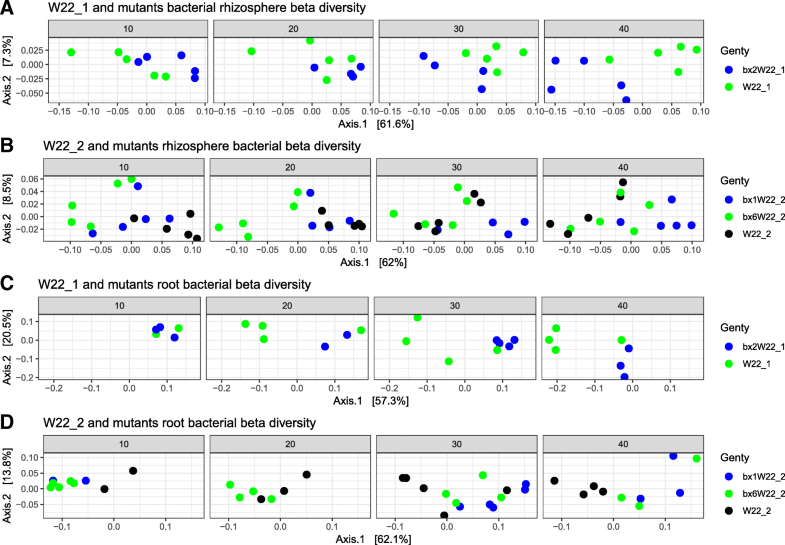 We first tested BX effects on microbial alpha and beta diversities by comparing microbial communities in BX mutants and their parent lines. Despite the overall genetic similarity among the maize lines, we observed that BX mutations explained a large part of the variation in microbial community structures not only in roots (bacteria 17%; fungal 13%), but also in the rhizosphere (bacteria 13%; fungal 14%). After splitting the data into each parental line and its corresponding mutant(s), analysis of the most significant sources of variation revealed that W22_1 and its mutant contributed the largest variation in both bacterial (20%) and fungal (13%) communities in roots compared to a lower but significant effect observed in W22_2 and its mutants. These results indicate that genotypic effect correlated with levels of BX quantified; W22_1 with higher BXs levels exhibited higher genotypic effect while W22_2 with lower BXs had smaller effect on both bacterial and fungal communities. 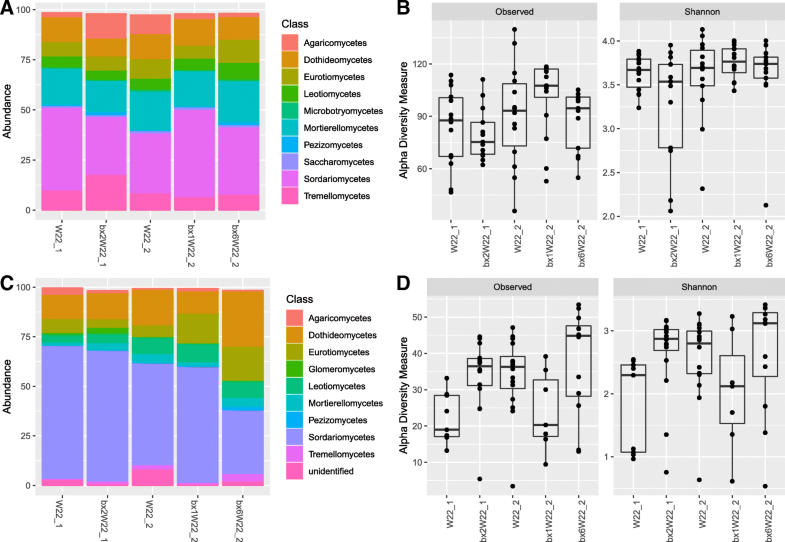 We therefore speculate that the degree of genotypic effect exerted by maize seedlings on the root microbiome is dependent on the level of BX present. 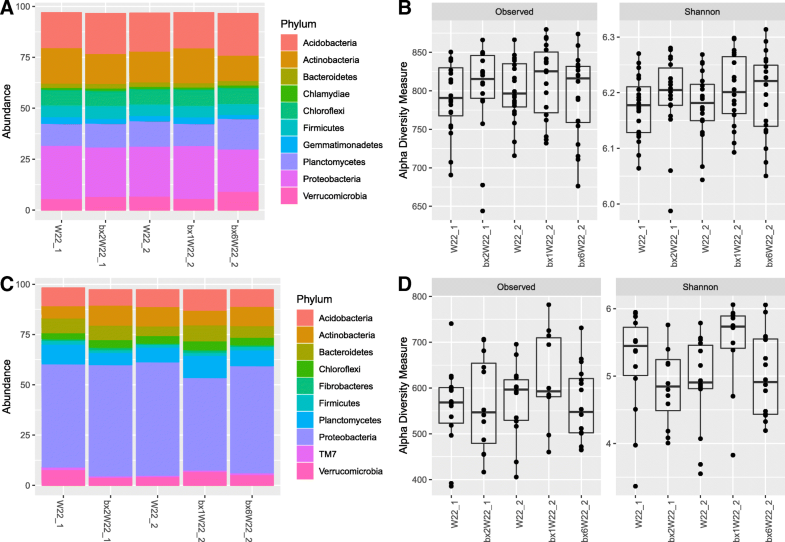 Plant microbiomes are known to be altered by plant metabolites [71, 72, 73, 74], and we corroborate these findings by presenting an in-depth role of specific secondary metabolites BXs as candidate exudates involved in assembling both below-and aboveground microbiomes of maize. 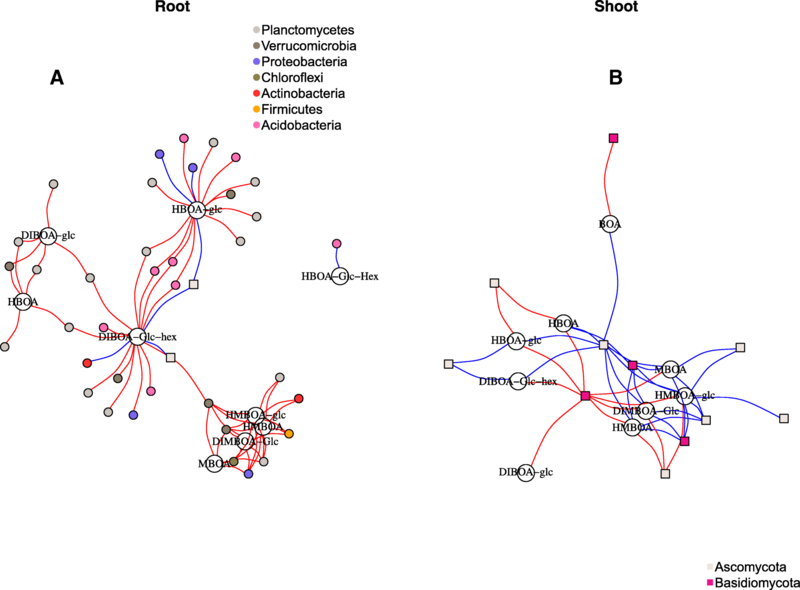 Recent study also showed potential role of BX on maize root and rhizosphere-associated microbiota at late maturity stage and at one time point . Our study however further expands the understanding of the mechanistic influence of BXs on the maize microbiome which is not limited to root or rhizosphere, but also in shoots, and in addition tracks BX-dependent effects at four different time points of early (40 days) plant development. To specifically target the effects of BX compounds on microbial communities, we performed correlation analysis of BX concentrations in plants against the relative abundance of OTUs at 10 DAS. Both positive and negative correlations between fungal and bacterial OTUs and BX metabolites in roots and shoots were identified. Interestingly, positive correlations among bacterial OTUs were mostly observed among members of the Proteobacteria, and negative correlations consisted of OTUs within Acidobacteria, Verrucomicrobia, Planctomycetes, and Chloroflexi. 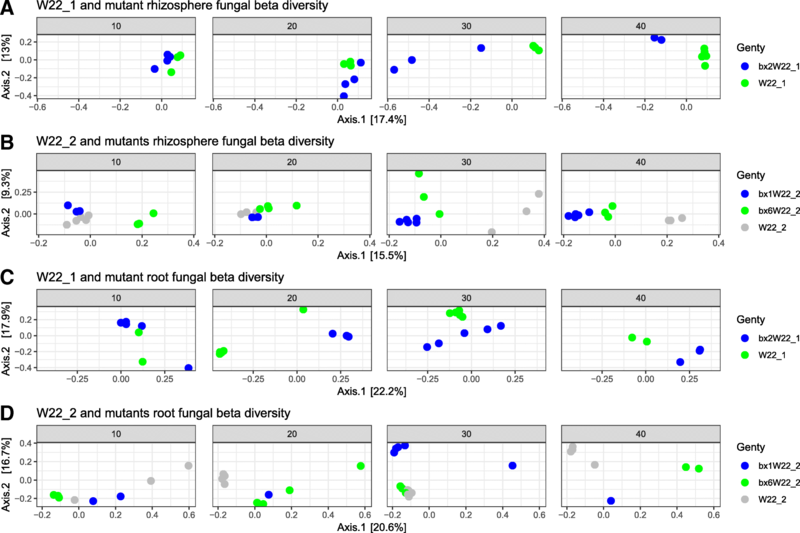 Only a few fungal taxa among Ascomycota correlated with BX contents compared to bacterial taxa, which could be explained by the fact that active recruitment of bacteria could happen earlier than fungi, or it could simply be caused by the large diversity of bacteria in the roots in comparison with fungi. In the shoots, fungal genera such as the pathogens Blumeria, Ramularia, and Puccinia along with the yeast Filobasidium were negatively correlated to BX contents. Because these pathogens were deterred by BXs already at an early growth stage (10 DAS), we speculate that BXs could protect against foliar pathogens. Several studies have similarly reported BX fungicidal effects on cereal pathogens. For example, the fungi Helminthosporium turcicum, Cephalosporium maydis, Fusarium moniliforme, Fusarium subglutinans, Fusarium culmorum, Gaeumannomyces graminis, Microdochium nivale, and Puccinia graminis were found to be negatively correlated to BX content [80, 81, 82, 83, 84, 85, 86, 87, 88, 89, 90, 91].